Whether you are converting your loft into a kitchen, a bedroom or a bathroom, you will need to have electrical access running up to your loft. Even if you are not planning to use your loft conversion for a bedroom or a living space, it is still a good idea to fit some electrical access into your conversion, if you ever need to do any work in your loft conversion, electricity in your loft will come in handy. The great thing about electricity in lofts is that electrical wires are flexible, they are not like drainage pipes or water supplies. Electrical wires can bend flex and easily be installed in any room, so it relatively easy to get electricity in lofts. The only disruption it may cause is if the wires need to run through your floorboards or your roofing. The electrical cable for your ceiling lights will almost definitely need to run through your loft roof, but this should not cause too much disruption. The only problem that may occur is if you need to fix wires into your floorboard, which you inevitably will need to do. Your electrician may be able to create loft access for the wires under the floorboards but if they come across any tricky areas it may be necessary to gain loft access from the room below, but this is unlikely. Once the electrical work has started on your loft conversion your loft room will soon start looking like a minefield of different coloured wires. For safety and practical reasons wires in lofts will need to be well protected. To protect the electrical wires this may involve you or your electrician installing them underneath your insulation or inside your stud wall when you are constructing your loft room. Some electrics in lofts will be more complicated than others. A loft bedroom will normally only need electrical sockets, while a loft kitchen may need electrics for an extractor fan and cooker. You may find that some lighting systems will also take a bit more work than others, spot lights will be a lot harder to wire up than one light in the middle of a room. 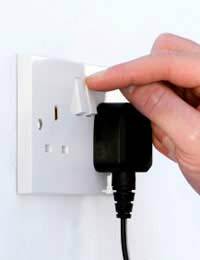 If your electrician hasn’t already offered, you should ask them if they can separate spurs for all of your appliances. For example if you are creating a loft kitchen, you should ask your electrician to create a main switch for each of the appliances, so that if something goes wrong with the electrics on one appliance you do not have to switch all of them off. If you have different switches for each of your appliances then you will be able to control them more easily and it will be a lot more accessible. Getting an electrical supply into lofts is relatively easy compared to the other elements of your loft conversions such as the building work and the plumbing work needed for lofts. This however does not mean that you should attempt it yourself. You will need to call in a professional electrician to do the work who will be used to working in lofts or you could end up blowing a fuse.